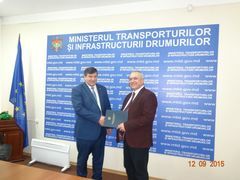 During the meeting Mr. Ciopraga handed over multilateral permit forms for international road transport. Multilateral permit forms for international road transport will come into effect started from 1 January 2016. Mr. Ciopraga and Mr. Kirinchuk discussed the implementation of the Strategy of the Intergovernmental Commission TRACECA for the development of the international transport corridor Europe-Caucasus-Asia, technical assistance projects in the field of transport and security, legislative harmonization initiatives, trade facilitation and institutional support. The participants of the meeting touched the issue of the implementation of the Action Plan on realization of the Concept of development of international road transport corridor Europe-Caucasus-Asia. TRACECA EU-programme was initiated by the European Commission in Brussels in the framework of interregional TACIS program in order to facilitate cooperation between Member States in all areas related to the development of trade and transport in the region and the Europe-Caucasus-Central Asia, transportation and simplification of customs procedures between country-members. Currently, TRACECA includes 13 member countries of the Basic Multilateral Agreement on International Transport for Development of Europe-Caucasus-Asia: Armenia, Azerbaijan, Bulgaria, Georgia, Iran, Kazakhstan, Kyrgyzstan, Moldova, Romania, Tajikistan, Turkey, Ukraine, Uzbekistan and Lithuania, which is provided in the IGC TRACECA as an observer.